Laundry rooms are supposed to be the place where everything gets clean, crisp and looking sharp… But does your small laundry room itself live up to the task? If you can’t find the pre-wash and you are navigating through open piles of unwashed laundry, you have a problem. 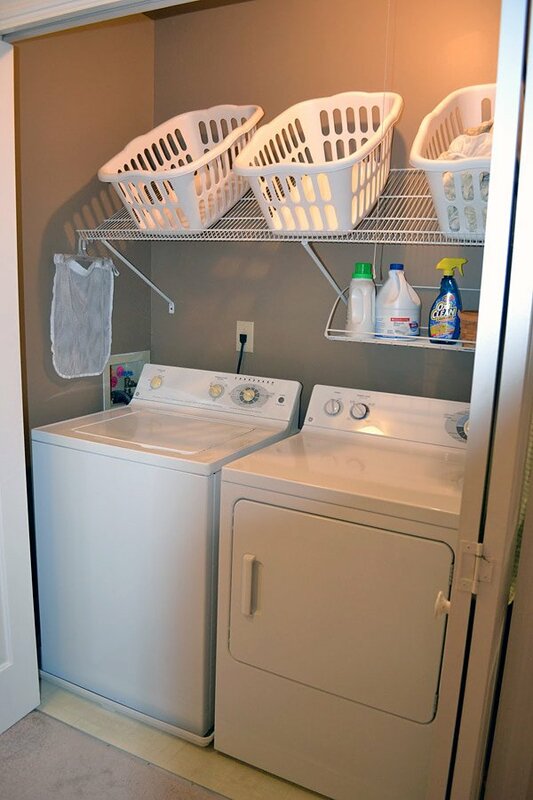 And if your laundry space isn’t very big to begin with, you need some DIY laundry room organization! Use these 10 awesome ideas for small laundry rooms to get the “organized” back into your “clean”! 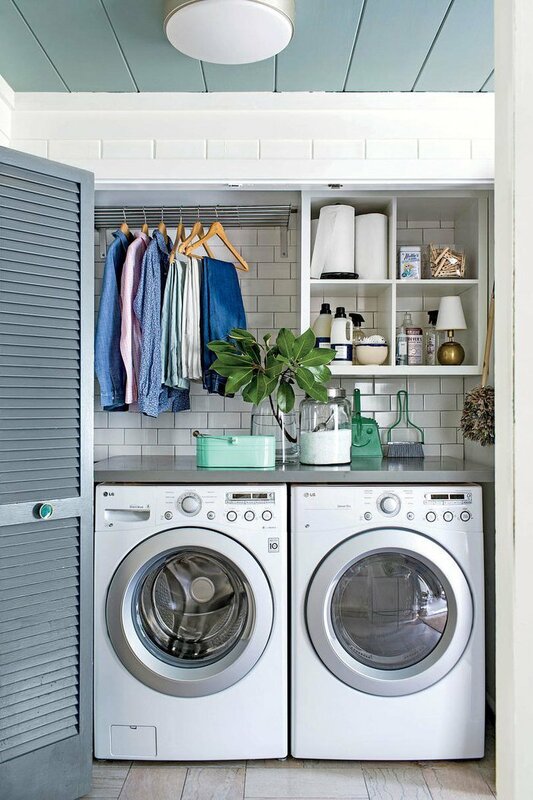 Is your small laundry room nothing but a closet? Then check out how ‘Southern Living‘ does it better! Instead of installing standard cabinets above the machines, they used open shelving over half the space, leaving enough room for a hanging / drying rack over the dryer. Genius! 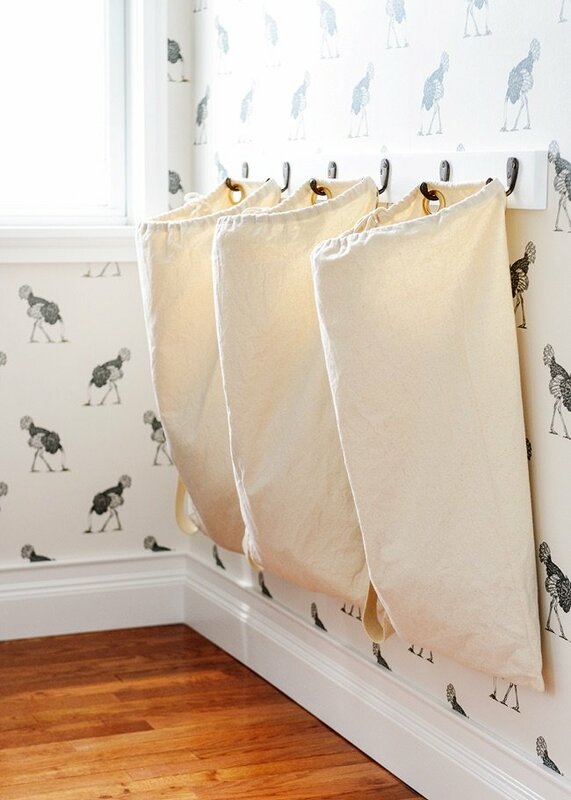 ‘Yellow Brick Home‘ keeps all the laundry off their tiny floor space by utilizing these great DIY laundry sorting bags that hang on the wall. These are made from canvas and should last longer than the clothes you put in them! 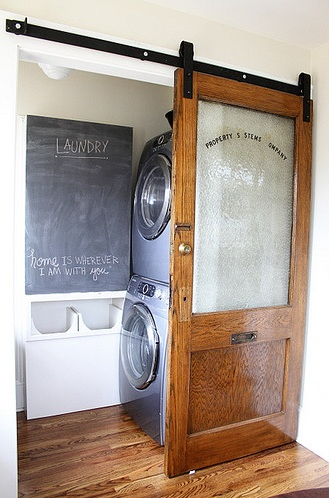 This small laundry room idea we found on ‘Pinterest’, and it is AWESOME! Love the sliding door to hide the space… This makes it easy to keep all the cleaning out of sight, and turn an unused awkward closet into usable laundry room organization space! ‘Home with Baxter‘ created this small laundry room inside a half bath while doing a remodel… I love that she took the time to make everything pretty! Beadboard and baskets make a big difference in a utilitarian space. If your home is so small (or old) that it doesn’t even have a laundry room, let ‘Fine Homebuilding‘ show you how to create a laundry room from a closet. ‘Hold on to Your Hats‘ shows us how just a few simple things can make a big difference. Slanted racks above allow easy access to items you need, and organizing with wall brackets keeps ironing supplies and the like out of the way. Easy diy laundry room organization! 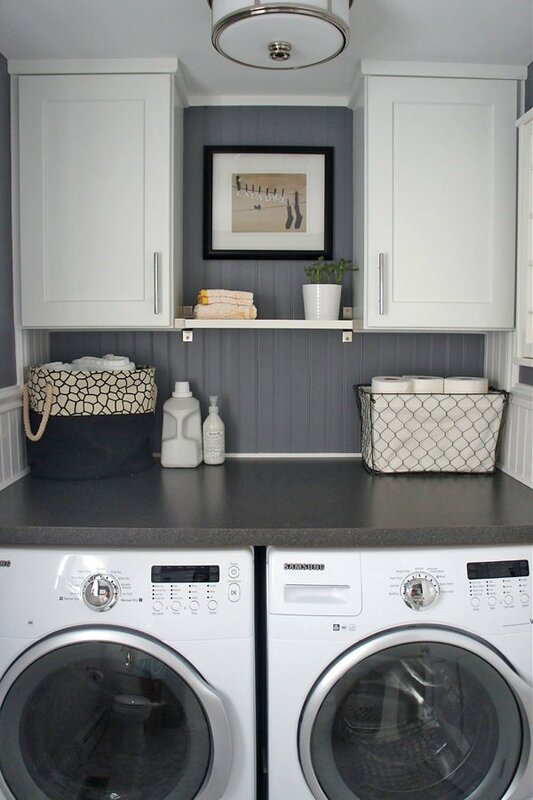 From ‘The Cavendar Diaries‘ via ‘I Heart Organizing‘, this small laundry room was created in the garage… I love the hanger rack right above the machines. 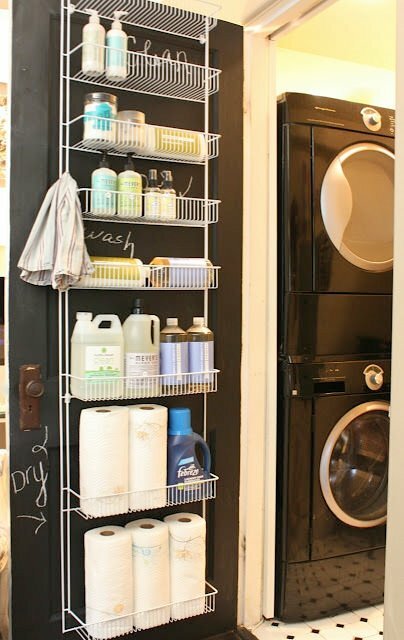 ‘My Sweet Savannah‘ turned this tiny laundry room into an organized space with a single change… a back of the door rack complete with chalkboard painted door for labeling. 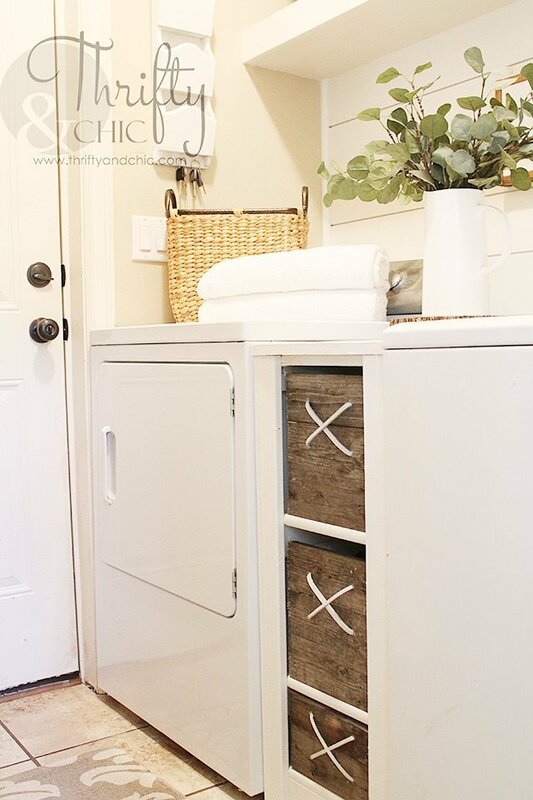 Did you get some great ideas from this post on Ideas for Small Laundry Rooms, for your tiny space? Then jump on over right now to our posts on 7 steps to an organized fridge or DIY closet organizing ideas! Love the 1/2 bath design. I live in a DWMH and hate my tiny very open laundry area. When I design my new house I want a 1/2 bath for guest and this would be so convenient as well as pretty. Is it z problem to use paibted wood cabinets in a outdoor room (no roof just pvc & aluminium pergola) when in the summer it this “room“ gets up to 31°c? That kind of heat will eventually damage wood and paint… is it an outdoor laundry space? Thx Sharon, we will get that fixed! I have a washer dryer outside on my covered patio. ANy ideas for concealing them? I was thinking of having a shed built with a flat top. I thought I could close the top and use it to serve food on when entertaining. Thats a great idea! Remember to leave enough space inside the “shed” to allow for the dyer venting hot air… Anyone else have ideas for Maggie? ANY ideas on how to cover these unsightly valves ? Put a box picture over it,Find a big enough box that would cover your area you try to hide. Paint it to match the wall color or glue a picture on the bottom( now front facing ). Sometimes you can find treasures like these in discount store, like Big Lots. All of these ideas have more space than my “laundry room.” It would be great if there were ideas for truly tiny spaces. I live in Arizona where stackable washer/dryer seems to be the ongoing trend. The only thing that fits in my “laundry room” is the washer and dryer. Any suggestions for how to the store the miscellany needed to wash clothes? Side by side, or stacked.What size is the foot print of your laundry space? That’s a great idea, we will keep our eye out and add it to the post if we find one! The idea I’ve been looking for, Thank you for sharing! Sorry Kimberly, it isn’t our project so we don’t have the answer for you! Wow, the closet laundry room is so amazing! A really efficient way to save space. 🙂 Fortunately we have a bit more space for the laundry room, but if that wasn’t the case, I would consider doing it. The other ideas are amazing as well, thanks for sharing! My washer and dryer are located in an area that has a door leading from the garage, a door going into the kitchen, a door leading down to the basement and another door leading outside AND there is a pantry. This is a very high traffic area as we come in from the garage and go into the kitchen. There is no way to enclose the W/D as there is not even enough room to do that. Other than moving the W/D downstairs, any ideas on how to keep my current area more organized, less cluttered, and more attractive? Stack them then use any left over space to hold shelves shallow enough to be out of the way of your doors. Even pegs might help if you space them so hangers with clothes on them fit. Mywasher and dryer is in the garage right now and I am in the process of enclosing them so the are part of the house. Because of where the water and electrical outlets are, they will face each other. I have not seen any laundry room designs with them facing each other. Does anyone else have this problem? I wonder if you could switch the door on one of them so you reach in on the side away from the doors and just toss them from washer to dryer. I know you can change the swing on frig doors. The dryer door should be able to be switched. I used to sell appliances. I want to put my laundry in a “cupboard” & have been looking at the great examples on Pinterest. But I can’t work out where the wadhing machine used water goes…there’s never any sign of a trough or water outlet, just a washing macine & dryer. Am I missing something? New to Pinterest & trying to work out where/how to post questions so please bear with me.Would welcome input. Hi Kay, we have just looked into this ourselves. the water needs to be plumbed in by a plumber, so cupboard needs to be close to the water network inside your house already. You may also need council consent to move your laundry, you need to check with your local city council. Generally the waste for the wash machine is in the same spot as where the water supply is, behind the wash machine. In newer homes it incorporated into a 12 x 12″ box that has a hot and a cold valve and hole/pipe for the drain. Older homes will have a pipe coming up through the floor. They have washer/dryer combinations now you could look into — 2 machines in one. 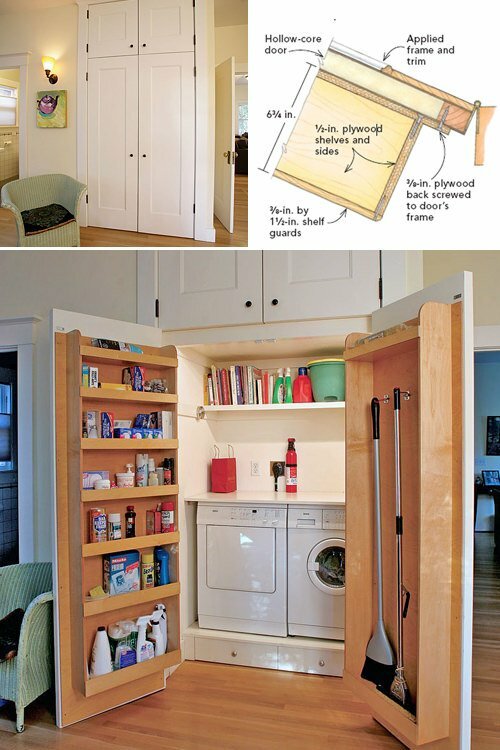 These ideas are really neat, but my laundry room is so small, I can only fit a washer in it. I have to hang all my clothes outside. Get a front loading washer and dryer set and “Stack” them on top of each other. That’s what I did when faced with a tiny Laundry space. You can also buy top loading washers that have a dryer built into a stack as well. Please be careful if you buy one unit washer and dryers. The European one I bought you put the laundry in and it washed and dried . Unfortunately it didn’t do a good job of either. The top and bottom unit I bought worked great until the dryer died. It was to expensive to fix so I lost both. I do have an LG washer and stacking dryer that can be separated if needed and I love them!